Kyna the sleepyhead – not really! You are already 2.5 months! While you used to be a sound sleeper, your sleep pattern has become a bit more challenging to deal with. So does your sleeping positions. Back when you were a few weeks old, all you would do was sleeping, crying, peeing, pooping and feeding. Well, you’re still doing all of the above, plus laughing and screaming. Sleeps and naps took approximately 18 hours a day. Back in those days mommy could get enough sleep despite you waking up at night asking for milk, mommy can actually have some spare time to do online shopping, and work (yes I occassionally open my laptop and work during my maternity leave). Anyway I’m lucky enough because your lullabies are not necessarily for babies, you could look at me in full serene if I sing. Any song! From linkin park to maroon 5 to goo goo dolls and even limp bizkit sometimes! The only problem is you wans me to carry you the entire time *back pain alert* As you get closer to 3 months, you know how to laugh, how to respond to tickles and sometimes you scream in joy 🙂 those nights are the moments that I treasure..
1. Sleeping on your side with mommy’s hand on top of her – yes, this is to contain involuntary hand movement that could wake you up. 2. Sleeping on your tummy – you could have a sound uninterrupted sleep of up to 6 hours. 3. Sleeping on mommy’s chest – and you’ll drool all over me. 4. 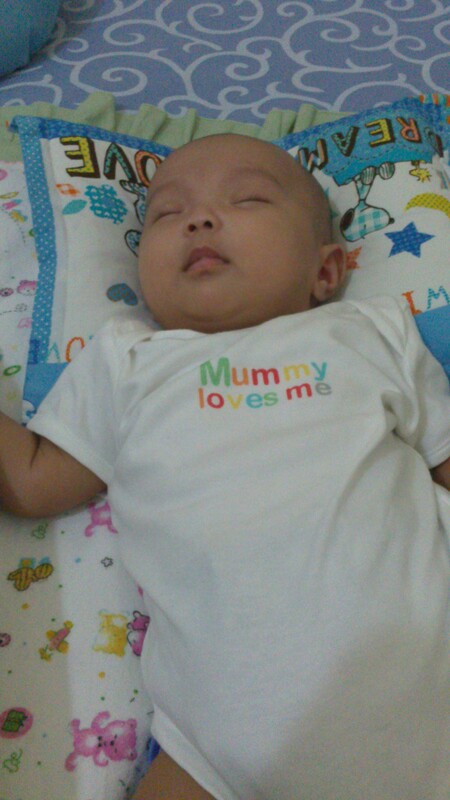 Sleeping on mommy’s arms – when you’re very cranky, you refused to sleep on your pillow and bolsters. Mommy had to let you sleep with your head on top of my upper arm and your face positioned facing my chest – leaving me with numb upper arm afterwards. 5. Sleeping inside the boba wrap – since you turned 2 months, I discovered that you love the hug hold / kangaroo hold when you’re being carried arround. My cheeky little rascal actually clings to me all the time. My wrist can’t take it, so mommy got the boba wrap. It works wonder with you – you fall asleep under 15 minutes in the wrap (versus the average of 1 hour without it).